The vineyards of Merfy, seven kilometers north of Reims, lie on the southern slopes of the Massif de Saint-Thierry in the Montagne de Reims. These slopes were planted shortly after the arrival of the Romans and monks of the neighboring Abbey of Saint-Thierry expanded the vineyards in the 7th century. By the 9th century, the vines surrounding the abbey represented the single largest concentration of vines in Champagne and the wines from Merfy earned a great reputation and found their way to the Royal table. With Chartogne-Taillet one appreciates the significance of terroir. Theirs is an example of just how wonderful wines can be simply because of how talented and conscientious they are. Their land, while good (Merfy is "84%" on the Echelle de Crus) is not aristocratic, and I'm certain if we could transplant them to, say, Aÿ or Mesnil they'd promptly take their place among the elite. Chartogne-Taillet is based in Merfy, where the majority of the estate's holdings are, and remains the only RM producer in the village. The soil in Merfy is clay, sand and sandstone over chalk, forcing the roots of the vines to "live in two environments" as Alexandre Chartogne puts it. Alexandre, now in charge of the cellars at Chartogne-Taillet, worked with Anselm Selosse in Avize and applies Selosse's ideas in the cellars and vineyards in Merfy. Alexandre vinifies each parcel individually some in stainless steel and a growing number in neutral barrique. "I wasn't surprised when Alexandre assumed the estate, and I wasn't surprised that he was ambitious. What did surprise me, and continues to surprise me, is that he is the most passionately curious vigneron I know, not only in Champagne, but just maybe anywhere. He is pursuing something that doesn't take the form of accolades though these will surely come--and hardly even asks for answers. It's a quest for a kind of immersion, an unquenchable desire to experience. Please note; to experience, not to "know". This year it was just him and me, tasting and talking; we did dosage trials of several wines, and this takes a person to the essence of tasting. The more we tasted the more wonderfully unknowable things seemed to be. Yes, it was possible to establish where the wines were most delicious and expressive, and the two of us agreed almost eerily. But even then, it was impossible to predict what would work, and each formulation you tried to make was smashed by the next sequence of wines. 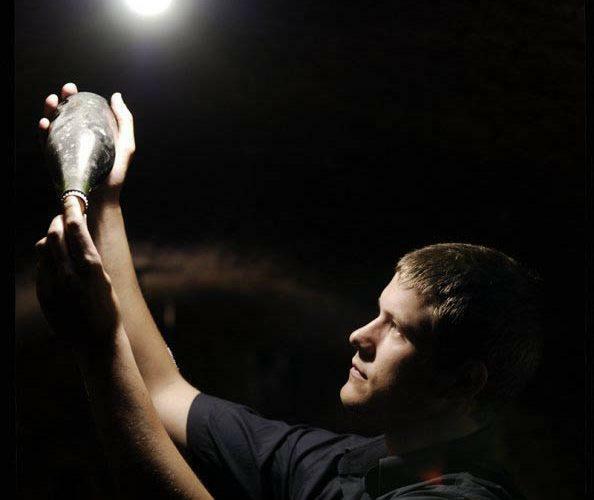 I believe that Alexandre Chartogne is the most exciting young producer in Champagne. And I also believe he drank from the fountain of wisdom when he said to me, "I do not feel good when I'm sure about something." Because that's how you measure the hunger in a man's soul. It begins with a new/old approach to vineyard work, bio-dynam-ish, one might say. Critters (sheeps and horses), soil analyses of remarkable detail, each aspect of viticulture challenged and changed as necessary. Cellar-work is also excitingly new. Indeed there's almost too muchinformation to give here. Alexander's blog is a lovely source for info and updates, and the estate's website gives all the basics. Suffice to say there's a vivid spirit of inquiry here, the likes of which I have never seen in this habit-riven region." "Champagne Chartogne-Taillet is produced exclusively from grapes grown in the family's vineyards at Merfy and neighboring Saint-Thierry and Chenay. Thirty parcels totaling 11 hectares consist of vines averaging 25 years old. Winemaker Philippe Chartogne was trained in Beaune where he learned the respect for the terroir and the passion for vinification. "Respect for the terroir means preserving old vines as long as possible, limiting yields and analyzing the soil of each parcel in respect of nature. Passion of vinification means tasting the berries long before the harvest in each parcel more than once, selecting very strictly at the harvest, a long and soft pneumatic pressing parcel by parcel, tasting the run-off juice and separating the 'cuvée' from the 'taille' before the vinification and blending the different cuvées."